BUSRide spoke with experts at the forefront of infotainment, to learn about advancements in the industry, and the future of rider engagement. What is “infotainment” in transportation, and how does it relate to your company? Cliff Anderson: With Luminator, the term “infotainment” is more about providing passengers with diverse types of information and media, and not as much about entertaining them. Aside from displaying schedule updates to passengers, there are other opportunities- such as onboard advertising, that are becoming very interesting to transit agencies. Being able to integrate multiple data streams simultaneously and enabling the operator to create and display their data is critical to providing a robust network solution of relevant information. With advertising for example, as mass transit passenger growth continues to increase, local business owners of restaurants, retail stores, sports centers, etc. want to draw those transit passengers off of the buses and into their nearby stores at the most opportune times. 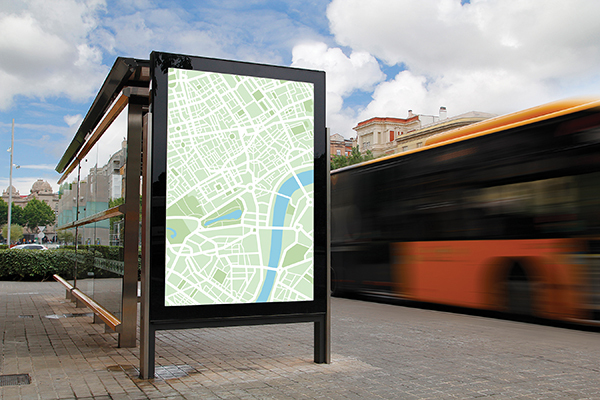 By providing well-timed, high definition advertising media to onboard bus passengers via LCD display screens, this creates new revenue generation streams for the transit agency beyond just traditional static poster advertising. Steve Halberstadt: Infotainment is the marriage of information and entertainment. Recent advances in user-friendly content management systems and more advanced LCD flat screen technology have made it possible to expand beyond the limited route and stop information earlier systems provided. Today, it is possible to deliver both pre-rendered and real-time content that’s relevant, dynamic, and engaging. Infotainment displays can be positioned at individual transit stops, at hubs and multi-modal centers, as well as on the vehicles themselves. Agencies can marry entertainment content, hyper-local advertising, RSS feeds, emergency messaging and real-time stop information on individual screens, delivering a better passenger experience and keeping customers informed during each step of their journey. Integrating passenger information with entertainment or other type of useful content such as news and weather is the future of digital signage on public transportation vehicles. When you add in the capability for sponsored local advertising and the promise of additional revenue that comes with it, the case for dynamic digital signage solutions is very strong. Tim Mark: Hanover Displays is, first and foremost, a manufacturer of on-board electronic equipment, primarily for use in the public transportation industry. We design our own products right down to printed circuit board and mechanical design levels, which enables us to control not only price and performance, but, most essentially, quality and reliability. The three main areas of our infotainment system (which is stand-alone but integrates directly with our destination signs) are: Hardware-Computer – Our high-performance Hanover Transport Computer (HTC) controls data processing, data communication and data display information; Hardware-Screen technology – Hanover offers a variety of TFT screen formats (standard or ‘stretch’) for use as single or multiple displays. The tendency is toward separating the stop information (on one screen) away from the network or advertising media (on another unit). These can be placed either side by side or one screen at the front and others towards the center or rear of the vehicle; and Back-Office or Content Management Software – ‘Hanover Central’ is a user-friendly software package which compiles stop & route information and allows pertinent media to be triggered according to a given geographical location. A media ‘playlist’ function is available so that multiple videos or files can be shown in succession and activated at precise points or on particular routes. What are the most significant advancements in infotainment in the past few years? Anderson: The most significant advancement has most likely been the ability to provide automated, real-time information updates remotely to passengers via wireless communication. Instead of posting static information that can become outdated or damaged, now advertising, service changes due to traffic or weather complications, daily news, and other updates can be immediately pushed out to transit customers to make their trip more efficient and enjoyable. Halberstadt: Today, hardware costs have reached a price point that makes mass adoption of solutions more viable, and they have been designed with the rugged environment of mass transit in mind. Advances in content management systems that support easy content updates and incorporate transit-specific functionality make infotainment an increasingly attractive solution being considered by many agencies. Agencies must provide their passengers with route and stop information, but are also quickly realizing that if they combine this information with other types of content — especially paid local advertising — they can generate additional revenue and enhance customer satisfaction. Clever Devices uses these emerging technologies that are purpose built for transportation, while understanding environment conditions, nuances, and public transportation requirements. We approach our digital signage solutions the same way we approach all our other ITS offerings. For example, our onboard CleverVision™ solution is able to function as an extension of a vehicle’s existing ITS system. We leverage the intelligence on the bus to power the content that is delivered. Based on this advanced connectivity we are able to target content delivery based upon many factors such as vehicle location, route, stop, and other conditions. Passenger counters allow for detailed reporting of viewership numbers. Agencies can use this information to set advertising rates and provide “proof of play” to local advertisers. Mark: There have been advancements in screen technology- larger TFT screens are becoming available, with higher resolution and in different form factors (‘stretch’ screens). Diminishing costs means multiple screens are an affordable option. There have also been advancements with the communications infrastructure, including increased data transfer speeds and bandwidth, which has led to the ability to stream or upload/download large files ‘on the go’. Media-based files that could only be ‘hand-loaded’ before, can now be exchanged wirelessly. Standardized data Feeds (e.g. GTFS) have also seen progression. The availability of ‘shared’ data means the system is always showing real-time information and is up to date. Trip planning and wait times across different transportation options (rail, bus, subway) can now be displayed with accuracy. How can operators / agencies use infotainment to engage their riders beyond route and stop information? Anderson: ‘Infotainment’ has become much more than just the display of route and stop information. These systems have become robust data networks that can be leveraged in many ways- visually, audibly, and in multiple languages. This strengthens the relationship a transit agency has with its local customers. News, weather, and local events keep riders entertained/informed. Wireless internet connectivity enables passengers to stay linked with their personal and business networks so that they can remain productive during their commute. All of this creates a strong reliance and feeling of confidence in the transit agency to keep riders connected and informed as they get to where they want to go. Halberstadt: There are exciting capabilities for hyper-local advertising that are made possible when the infotainment system on a vehicle is aware of transit-specific conditions such as route, stop, speed, passenger load, operator, and more. Triggering content based upon these conditions provides for a much richer and targeted user experience. For instance, we can schedule advertisements to play when a vehicle enters a geofenced area, but only when heading southbound on certain routes, ensuring that the rider sees an advertisement for an establishment located at a stop and street the passenger will have access to. Mark: Connectivity can help engage riders, with on-board Wi-Fi now widely available. It can be used by the system while the bus is on-route to provide true real-time information for travel time & correspondences. Transit agencies are obviously looking for new revenue streams all the time, and these systems are ideal for providing geo-localized ads. Enforcing transit agency brand awareness and providing network news updates or introducing new technologies that improve the ‘end to end’ rider experience will all lead to increased ridership. Live news feeds and local weather forecasts, either run as ticker-tapes, or using reserved areas of the screen, have been shown to be noticed and appreciated. News can also include shows, movie theater or concert information at establishments open near specific stops. On longer journeys movies, music videos or TV shows can also be used to keep the passengers entertained and once again to improve the ridership experience. The streamed technology is also, obviously, a vast improvement over the traditional DVR solution. What factors are driving innovation in the infotainment field? Anderson: Customers, operators, and technology are all driving the market for stronger adoption and relevance. Customers want to be able to ‘keep doing their daily activities’ while they happen to be commuting. Operators want to increase ridership by not just eliminating the hassles of mass transit, but by making it the preferred method of transportation in their areas of operation. Technology advances provide the backbone to enable both groups to give each other what they want. Halberstadt: Many agencies are cash-strapped. Infotainment and digital advertising is a straightforward way to generate revenue. Digital advertising – especially localized digital advertising with verified reports of delivery – offers an added revenue stream for many reasons. First, the cost to serve is significantly less. With almost no manual labor involved, it is less expensive than traditional advertising. Secondly, advertisers are often willing to pay a premium for content that is targeted to specific locations and conditions, and has been verifiably played to recorded numbers of viewers. We are a generation that has come to depend on instant digital gratification. As such, the acceptance of, and even demand for, digital stimulation as we use public transportation is a key driver of innovation as agencies continue to pursue ways to enhance the passenger experience and encourage ridership. Advances in technology have brought increased options to persons in need of transportation. Uber, Lyft, ride-sharing applications, and others have put increased pressure on public transit to provide an experience which remains competitive for choice riders. Users now expect and DEMAND that service information be ubiquitously available and easily accessible. Research suggests that millennials prefer public transportation to car ownership, with a large majority gravitating to big, urban environments. This demographic is educated and demanding. They expect information at their fingertips, in real-time and without fail. Mark: The connected world and the IoT (Internet of Things) are now a part of public transit and it is changing the way people organize their lives. Remember, one of the biggest challenges for transit agencies in the past has been to convince individuals to use public transportation and not drive their cars. One of the major factors working against that has always been the fear of not getting on or off at the right stop, not feeling reassured or informed enough about the travel environment. The ‘end to end’ experience from leaving home to arriving at the place of work and knowing what is happening throughout that journey makes for an easier and more enjoyable ride. Now all of that information is either on the screens or on your phone. What kind of infotainment concepts, technology or innovations can operators / agencies expect to see in the coming years? Anderson: Increased wireless throughput will continue to create new opportunities to keep passengers entertained and informed. However, the need for enhanced security/surveillance will be one of the big growth drivers for us. Being able to capture a high definition video stream of the passengers onboard, and displaying that stream to the onboard display screens, will help to deter crimes against passengers, drivers, and property, as well as reduce liability claims against an operator. This is one of the reasons that Luminator acquired Apollo Video Technologies earlier this year. The Apollo video solution can not only be accessed by the transit agency, but also by law enforcement in the area. Each bus is equipped with a highly advanced DVR and a wireless access point that allows law enforcement to log-in locally through their in-vehicle laptops within 100 feet of the bus. This gives first responders a live view of onboard activity to quickly review previously recorded footage after an incident. This wireless access also allows law enforcement to determine in real-time if a bus needs to be stopped in order to assist with incidents as they are happening. So, as you can see, the safety benefits of these solutions continue to expand for transit agencies, their employees, and passengers. Halberstadt: Two thoughts come to mind: The first is enhanced interactivity. We already supply interactive signage for wayside installations, but this can be extended to the on-vehicle environment. Onboard signage may soon offer enhancements such as localized hotspots for user’s smart devices, allowing the delivered content to become personalized not just for the transit environment but for the individual user as well. Imagine each rider having content delivered to their own “screen”, and tailored to their own needs such as desired stop location, preferred language, and accessibility needs. From wayfinding functionality that make safely navigating to a destination easy and interactive to a digital onboard “concierge” that answers questions or recommends local places to eat or visit, it’s likely that we’ll start to see these types of solutions, already available in retail and hospitality, infiltrate their way into the transit environment. The second is screen technology. We’ve already come a long way and as technology continues to evolve, we expect to see hardware as we know it become obsolete. Instead of hanging a screen on the wall, we anticipate technology that will become more organic to the vehicle, changing the way information is delivered, and providing an even more rich and engaging experience. Mark: Firstly, public transportation will adapt to the modern personal information environment that is continuing to evolve. Secondly, if the cost of screens falls sufficiently and all the paper advertising can be replaced by electronic media, there will be more and more displays on-board. And lastly, will buses and coaches end up like airplanes with individual screens where passengers can ‘tailor’ their information needs, or will the smartphone/tablet generation prevail and the infotainment system then becomes yet another ‘App’?